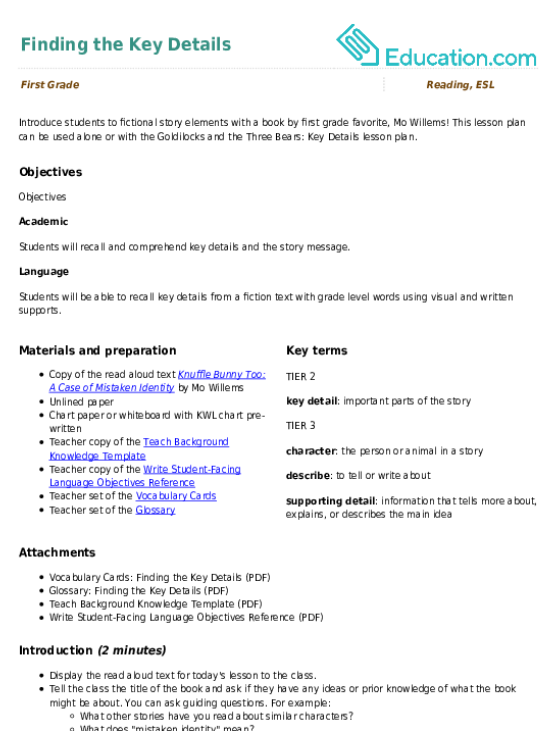 This lesson can be used as a pre-lesson for the Questions for ComprehensionLesson plan. Students will be able to ask and answer questions about key details in a text. Students will be able to ask and answer questions about key details from a fiction text with grade level words using written supports. 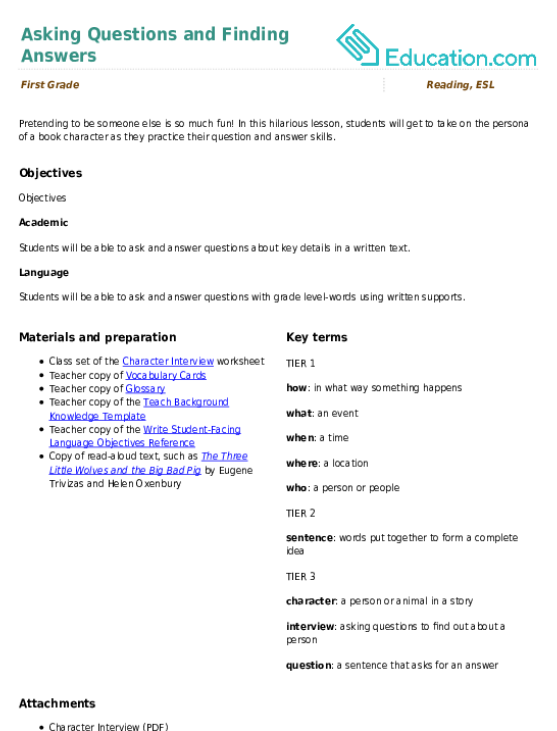 Display the read-aloud text for today's lesson to the class. Ask the class if they have ever felt nervous or scared about starting something new. Have them turn and talk to a partner to share out. Explain that today we will be reading a book about somone who is starting her first day at a new school. Before beginning the read-aloud, explain that during today's reading lesson you will be focusing on asking and answering questions. Remind students that we ask questions to find out more about something. 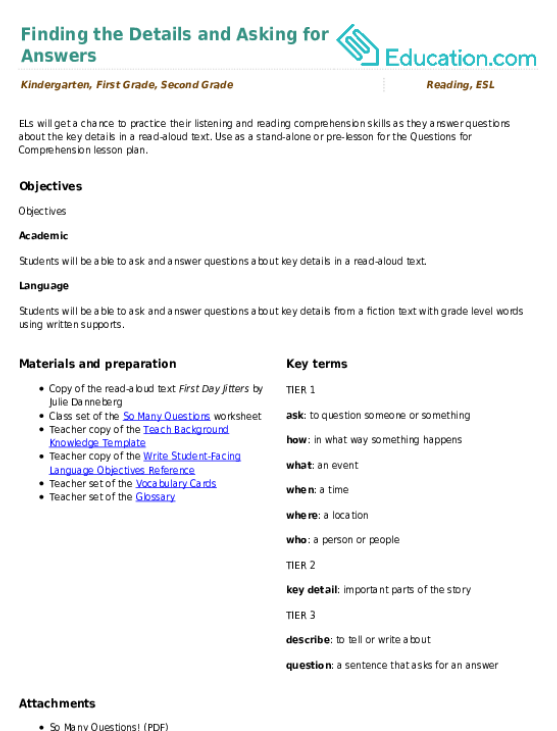 Introduce or review the tiered vocabulary words using the vocabulary cards and glossary. Tell students that sometimes we refer to question words as the "5 W's" because the words who, what, why, when, and where all begin with the letter W.
Write up sentence starters that include each of the 5 W's on a classroom anchor chart titled, "Question Starters" for students to reference. Have students practise using one of the 5 W's in a question sentence to a partner, asking about their morning (e.g. What was the first thing you did this morning?). Read aloud a few pages of the text First Day Jitters. Then ask students to make a prediction of what they think will happen next in the story. Have students share their prediction with a peer. Read the remainder of the story. Ask students to share if their prediction was true. If not, did something happen that surprised them at the end of the book? Explain that now students will get a chance to ask two more questions about the text. 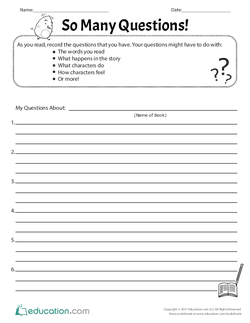 Display the So Many Questions worksheet and demonstrate how students can use the worksheet to write additional questions about the text. For example: Why was the main character nervous? Who were the other characters in the class? Remind students that good questions are open ended, meaning that they cannot be answered with a simple yes/no, and might be answered in a variety of ways. To check for understanding, give a few yes/no questions to the class and ask if they are good questions and why or why not. Pass out the worksheets for students to complete independently. 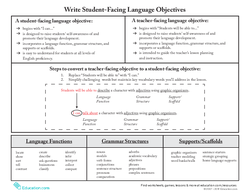 Provide students with sentence frames that include who/what/where/why/how to utilize as they write their questions about the text. Pair students up with a partner to collaboratively write questions for the text. Have students trade questions with a partner and verbally share their answers to each question. Have students record their answers as time allows. Assess student understanding by listening to the questions they come up with in the beginning of the lesson. Are students able to formulate appropriate questions with the scaffolds provided? Why or why not? Collect student work samples and assess if students were able to ask open ended questions using the classroom anchor chart for support. Gather the class and have students share one of their questions with a partner. Have students share out if their questions or answers were different or the same as their partners. 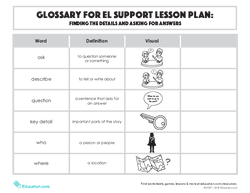 Use this glossary with the EL Support Lesson Plan: Finding the Details and Asking for Answers. 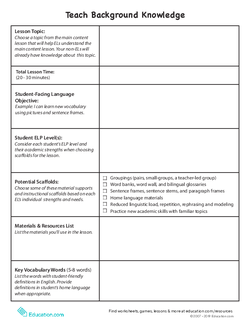 Use these vocabulary cards with the EL Support Lesson Plan: Finding the Details and Asking for Answers. 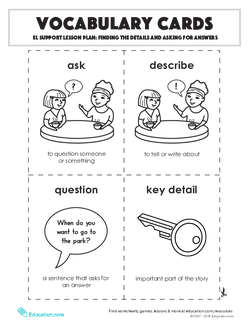 Use these vocabulary cards with the EL Support Lesson Plan: Asking Questions and Finding Answers. In this hilarious lesson, students will get to take on the persona of a book character as they practise their question and answer skills. Great writing is in the details! 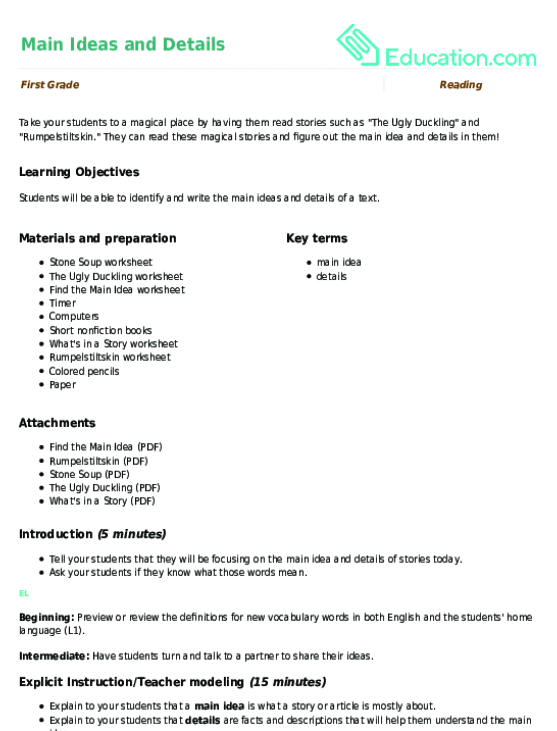 As students revise their narrative writing, encourage them to use more descriptive details. Practise writing about Amazing Girl by using your imagination to answer the questions asking for a description of this unique super hero!